Nagi Sanzen'in is the sole heir to the Sanzen'in fortune, as she is the only survivor of the family besides her grandfather. She isn't just your average 'rich girl'. Calling her 'rich' would be selling her short. The "Sanzenin fortune" is so large, throwing away 20 trillion yen in a red herring investment is considered a prank. Moreover, Nagi fell for that 'prank' when she was a child - she's 13 now, and by far wiser. She doesn't particularly desire the inheritance - she's been taught enough about the stock market and general finance that she'll never run out of money even without it (and her impulse expenditures alone comprise purchasing entire supermarkets). However, other people do want that wealth, and will acquire it by any means necessary, leading to many complications for Nagi, the least of which involve kidnappings and attempted assassinations. Since going outside is very dangerous because of her status, Nagi favors staying at home. Not liking company in general, she lives away from her grandfather in a 'small' (well... compared to the main Sanzen'in estate) mansion with minimal staff. Despite her Otaku NEET-like lifestyle, she is intelligent enough to skip 3 grades at school, which even turns out to be one of Tokyo's most prestigious academies. Her Otaku-level is high enough that she's submitted entries for multiple amateur manga competitions. Not that she ever wins them... her art is decent (she started drawing almost from when she was a toddler) but her sense of plot is incomprehensibly warped, not to mention her art style is odd at best. Her genres clash and she draws a magical girl story in the style of a Shonen Manga (read: very muscular, very masculine magical girl who behaves more like a samurai). On Christmas Eve, Nagi runs into male lead Hayate Ayasaki, a poor 16-year old boy who’s just been given a huge debt by impossibly irresponsible parents and is on the run from the Yakuza. In his desperation, Hayate tries to kidnap her for ransom and in the process and declares he "wants" her, which Nagi mistakes for a love confession. One thing leads to another and Hayate ends up rescuing Nagi from some real kidnappers. She then returns the favor by paying off Hayate's debt to the Yakuza for him and has him become the (very competent) junior butler at her mansion to pay off his debt. Hayate remains unaware that his mistress has a crush on him because of the unresolved misunderstanding. Nagi gets very jealous when Hayate swoons over Maria (her maid and elder sister figure) or when she catches him in other suspicious situations. At other times, she spaces out in romantic/cross-dressing thoughts over Hayate and has trouble finding words during romantic moments they share. In short: she's a Tsundere. Sometimes, knowing your opponents before they've even heard of you really helps. 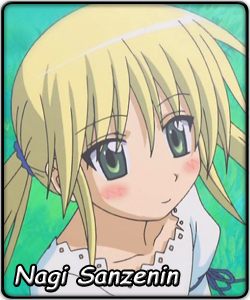 As an anime-otaku, Nagi's knowledge of certain opponents made her an explosive dark horse in the 2007 Saimoe Circuit. Her first match in Korea was against a handful of trivial unknowns... and a certain contestant she idolized - then two-time semi-finalist and parallel counterpart Shana (Shakugan no Shana). Though both stood out in the first round, Nagi turned heads by defeating Shana by only 3 votes, though both get to move on. She followed that up with an explosive second round which included a victory over Nayuki Minase (Kanon), but after being paired up with old karaoke rival Ayumu Nishizawa, a girl from the same series who also loves Hayate, a split vote concluded in a 305 vote loss to Evangeline McDowell (Negima). Due to Korean Best Moe rules, Nagi was still allowed to move on to the knockout rounds. A dominating performance in the round of 64 led to a matchup with fan-favorite Mai Kawasumi (Kanon) in the round of 32, where Nagi kept her momentum and upset Korea and the world with an 85 vote win. However, in the round of 16, Nagi was paired with Kagami Hiiragi (Lucky Star), who came prepared thanks to her best friend and teammate Konata Izumi, also an anime-otaku. For this, Nagi fell short by 472, and eventually finished in 14th place. Unfortunately, she was also forced to see her own love-rival, Hinagiku Katsura, take home the Korean Best Moe crown after a two-point victory over Shana. For this, Nagi took matters into her own hands in Saimoe Japan 2007. After deliberately blasting through Japan's preliminary rounds, Nagi once again found herself facing Shana in the round of 16, this time in a head-to-head matchup. It was once again a close battle, but it was the same song, second verse, as Nagi narrowly edged Shana by 18 votes and entered the top 8. There Nagi avenged her loss to Kagami by defeating her best friend Konata by 62 points. Her final four journey became a Higurashi no Naku Koro Ni minefield. Her semi-final match was against Rena Ryuguu, to which she defeated by 92. This earned her the right to participate in the final match. However, surprise contestant Rika Furude, who came off her semi-final match in a 5 point victory over Shinku, took the reigns again, and Nagi ended up losing in the final match by only 22 votes to her own disappointment. Nagi's chances to match Hinagiku's Korean championship revitalized after earning an entry in Korea's Super Best Moe. Her preliminary matchup against Rin Tosaka (Fate/Stay Night) proved to be a tough matchup, provided Nagi has never heard of Fate/Stay Night. After a 2nd place finish behind Rin in her preliminary matchup, Nagi put experience into full use, as she was able to defeat Rin in a rematch by 134. However, in the final 8 matchup, Nagi ended up being steamrolled by Yuki Nagato (Suzumiya Haruhi no Yuuutsu), thus resulting in an 8th place finish. Nagi expects to return to the Saimoe Circuit this year, along with Maria, Hinagiku, and Ayumu. However, with a qualification to enter the International Saimoe League, Nagi will probably be doing a hikkimori session before her first matchup, as not only will her past opponents, including the heavily favored Shana, enter the fray, but she will also face new challengers, such as the Rozen Maiden dolls and the mages of Magical Girl Lyrical Nanoha. Despite this, Nagi is determined to win the International Saimoe crown this year.